Sat., Dec. 24, 2016, 4:04 p.m. 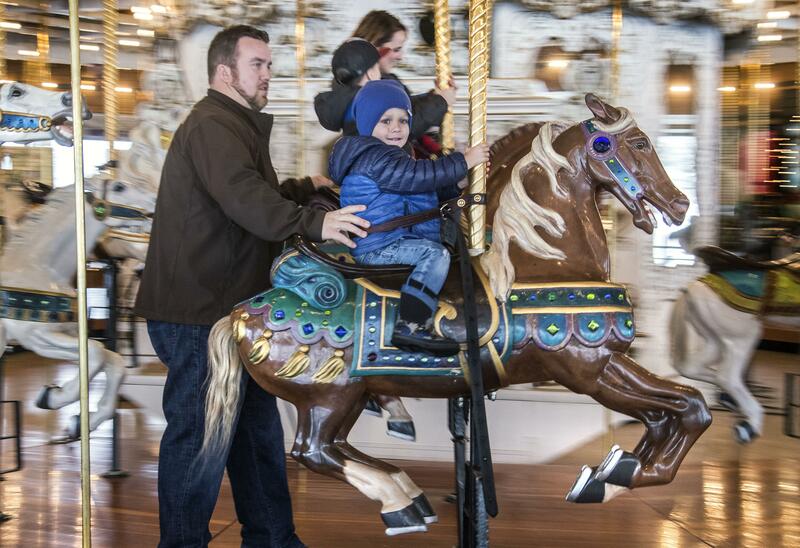 The horses spun and children laughed as families turned out Saturday for one last ride on Riverfront Park’s vintage Looff Carrousel before it is put into storage Jan. 1. Blair Roland was there with his wife, Rebecca, his three young boys and his entire extended family. The children eagerly lined up to ride again and again on their favorite horses. The family tradition started with his sister and her family a decade ago, and Roland and his family joined in a couple of years later after their first son was born. It’s something everyone looks forward to every year. The Carrousel is part of the ongoing reconstruction project in Riverfront Park. It will be open for the First Night celebration on New Year’s Eve, then it will be packed up and put into storage. Its current building will be torn down and a new, larger one built in its place. The project is expected to be done in early 2018, which means it won’t be available for any Christmas Eve celebrations next year. This year, she brought along three foster children who are living with her, and who all enjoyed their first time riding the vintage horses. Shumway said she likes the attraction because it appeals to all ages. Her oldest son, age 13, tries to grab the rings, while the youngest children just enjoy riding the horses. “It works for all of them,” she said. Shumway said she didn’t realize the Carrousel was being taken down and would be unavailable next year. There’s still a chance to ride the Carrousel before it closes. It will be open 11 a.m. to 4 p.m. daily this week. On New Year’s Eve, the last day of operation, it will be open until 11:30 p.m. Rides are $2 each, or $10 for eight rides. Published: Dec. 24, 2016, 4:04 p.m.